Sold as a 10-month-old bull calf in the 2012 SydGen Production Sale, BLACK PEARL blew away his contemporaries at yearling, with ratios of 116 for ADG, 113 for adj. YW, 129 for %IMF and 127 for REA. 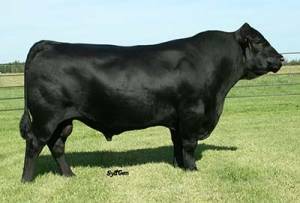 BLACK PEARL is currently the top $B Value son of SydGen TRUST 6228, the powerful ORIgen sire that has earned the accolades of many cattlemen in the U.S., Australia and New Zealand. BLACK PEARL is also seeing wide-spread use in Australia and New Zealand this past year, due to his massive body type and excellent feet and leg structure. His dam has long been the daughter of the $160,000 Connealy Forward chosen to represent Forward daughters in this sire directory, and she has left an incredible legacy of combining power and muscle with calving-ease.